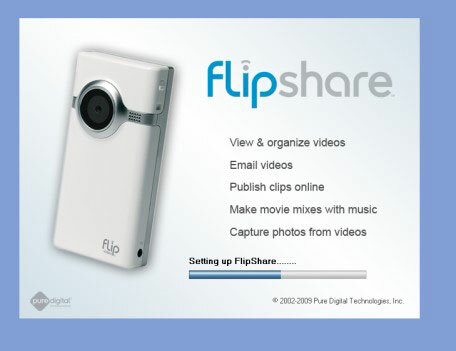 When you plug your Flip camera into your computer for the first time, your Flip’s preloaded FlipShare installer program automatically launches itself and prompts you to install the FlipShare program. A few clicks later, and voilà!, you’ve installed FlipShare on your computer. Wondering whether the FlipShare installer program preloaded on your Flip is the latest and greatest version known to man, woman, and child? Have no fear: When you run FlipShare, it automatically checks for updates. If a newer version is available, a prompt appears, asking whether you’d like to update your FlipShare program to the latest version. You can also download the latest version of the FlipShare program from the company’s Web site whenever you want. For your Mac or Windows computer, go to http://www.theflip.com/support and then skip ahead to Step 3 in the following set of steps. Plug your Flip camcorder into one of your computer’s unused USB ports. If you’re using a Windows computer, the AutoPlay dialog box appears, as shown below. If you’re using a Mac, a Finder window appears. Scroll to the bottom of the AutoPlay Control Panel window. Click the Reset All Defaults button. Click Open Folder to View Files (Windows) or skip to the next step if you’re using a Mac. Double-click the Setup FlipShare icon (Windows; proceed to Step 4) or the Start FlipShare installer icon (Mac, skip to Step 5). The User Account Control dialog box appears (Windows). The FlipShare splash screen appears, and then the User License Agreement dialog box appears. Click the I Agree button to accept the FlipShare User License Agreement. The Setting up FlipShare progress gauge appears at the bottom of the FlipShare splash screen while the installation program progresses, as shown below. When the installation is complete, a message appears, informing you that you must reboot your computer (Windows) to complete the installation. Mac users can continue to Step 7. Click the Exit button (Windows) to close the dialog box. If you’re prompted to restart your computer to complete the installation, quit any other programs you’re running, and then restart your computer. 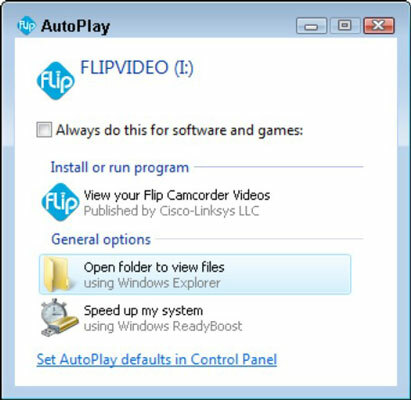 If you recorded video with your Flip even before you installed FlipShare, FlipShare may automatically launch itself after you restart your computer. No matter which method (preloaded or downloaded) you choose or which version of the FlipShare installer program you run (Mac or Windows), the desired result stays the same: getting this business of installing the FlipShare program to your computer’s hard drive out of the way, so you can now focus on more creative endeavors.